Home ⁄ Caterers and Restaurants ⁄ Caterers and Restaurants ⁄ Jumjoji: Misprint? Mistake? or for real? Opening of a new Parsi restaurant JUMJOJI at JW Marriott Mumbai next to the airport! Please read the last line of the fine print. What do you think ? Misprint? Mistake? or for real? In addition to their lineage, customs and community achievements, Parsis are fiercely proud about their food. 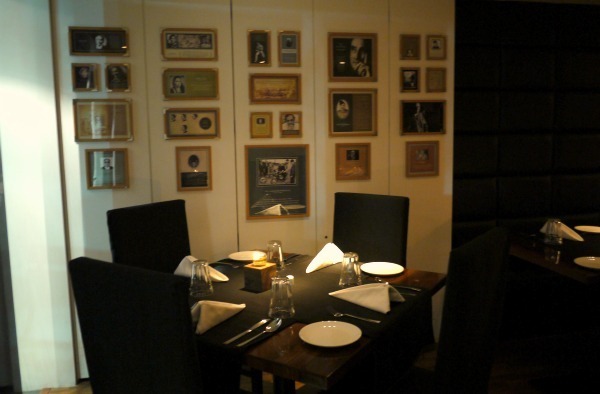 Not surprisingly, the walls of Jumjoji, a week-old upscale Parsi diner in Bandra Reclamation near Lilavati Hospital, reflect this Parsi pride in the form of neatly framed photographs of historic Parsi achievers including field marshal Sam Manekshaw, model and actress Persis Khambatta, businessman J. R. D. Tata and music conductor and violinist Mehli Mehta. In a mere 600 square feet, the owners have packed in a number of community-specific decorative features—traditional votive candles, a vase full of sandalwood sticks commonly found in fire temples, and pencil drawings of their winged symbol, the Faravahar—which have been subtly accommodated in an elegant room painted in white and midnight blue. “Jumjoji” is Gujarati for let’s go eat. In this case the invite is on behalf of Boman Irani, a businessman who runs a hotel management institute in Khopoli. Since south Mumbai has the largest concentration of Irani cafes, most of which close right before dinner, Irani’s intention was to start a full-fledged Parsi restaurant this side of town. He has employed students from the institute in the kitchen, boys in their late teens and early 20s who trained in Parsi cooking at the homes of Irani’s extended family members. The menu is thus peppered with dishes named after Irani’s kin, for instance Piroja Irani’s chicken sticks, Freni aunty’s mutton dhansakh, and Pari Batliwala’s chicken kebabs. You may rue that Jumjoji lacks the charming old-fashioned appeal of the city’s beloved Irani cafés, but you can take heart in the fact that its menu is almost identical to those served at these cafes. Typical of a Parsi joint, there’s more choice for non-vegetarians. Piroja Irani’s chicken sticks are a great meal opener. The dish comprises toothpick-speared pieces of boneless chicken marinated in a spicy green chutney and then deep fried in the same batter used in the preparation of fried chicken patties. We don’t know Piroja Irani, but we can imagine this delicious bite-sized appetiser being the toast of her house parties. Next we tried the akuri, the traditional masala scrambled egg concoction, which was thankfully not too oily and had just the right amount of chopped green chillis. Freni Sanjana is another of Boman Irani’s relatives with commendable culinary talent. According to the menu, Freni aunty stumbled upon the recipe for mutton dhansakh while rummaging through her great grandmother’s belongings back in 1954. The tawny gravy was thick, spicy and full of the robust flavour of the tender pieces of mutton cooked with the fat. If you want just the one filling option, get the dhansakh, which is served with a handsome helping of a basic brown pulao and a kachumber of tomato, onion and cucumber. At Rs450 for the patra ni macchi, we were expecting more than just half a fillet of fish. However, the measly portion was the only fault we could find with the banana leaf-wrapped steamed fish slathered with a fiery green coconut and coriander chutney that had a welcome hint of sweetness. The most meritorious dish was the moderately spiced, moist mutton biryani garnished with a handful of deep brown fried onions. It’s not on the menu yet, but the server unfailingly mentions it to all diners. Zenobia Zorabian’s lagan nu custard was sadly too sweet for our liking. It tasted more like a cinnamon-scented mithai than the airy Parsi custard we love so much. We left Jumjoji feeling not just sated, but also excited, for ourselves and the suburb. The restaurant is a welcome addition to Bandra’s food scene, which is overrun with sub-par multi-cuisine restaurants. And for those of us living north of the Sea Link, it makes perfect sense to dine at Jumjoji when those Parsi food cravings strike. A meal for two costs approximately Rs1,200.